The cost of rearing pigs in Great Britain increased by 8 per cent in 2017, to £1.37/kg. This was broadly in line with the average EU figure of £1.36/kg, a 7 per cent increase in sterling terms compared with 2016. 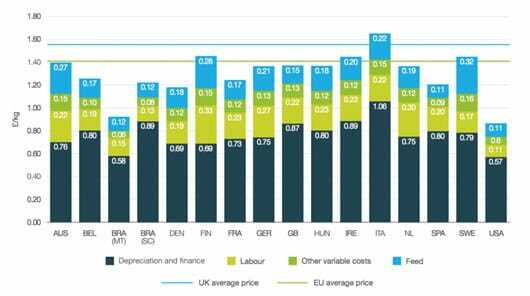 However, within the EU, come countries were producing at significantly below the GB figure, including Denmark at £1.18/kg, Spain at £1.20/kg and France, £1.24/kg. At the other end of the scale, the Italian figure was £1.65/kg. But, arguably, of even greater interest in the context of the ongoing debate about potential post-Brexit trade deals, the US 2017 cost figure was just 0.86p/kg, highlighting why there is such concern about the threat posed by cheaper imports produced to lower standards than permitted here.